Do you want to transform your bathroom into a place of luxury? 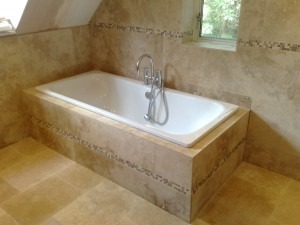 At Stile-It, we have the knowledge and skills required for luxury bathroom design in Chilworth properties. With our keen eye for design and careful craftsmanship, we can create a bathroom which is perfectly suited to you and your home. Whether it’s a bathroom, en-suite, or wet room, we can take out and dispose of your old fitting, install the new suite, and take care of all the finishing touches. All products are sourced from renowned suppliers, and will be fitted by our skilled tradesmen who have provided a luxury bathroom design service throughout Chilworth for over a decade. Why choose Stile-It to create your Luxury Chilworth bathroom? There is no better addition to your Chilworth property than a luxury bathroom designed by our team at Stile-It. In order to get a clear idea of what you want from your dream bathroom, we will discuss all areas with you beforehand such as themes and layout preferences. We will also work to your budget, however big or small, to ensure you get the most from your money. Not only is our business is approved by Check-a-Trade, but we are also CSCS card holders, so you can guarantee that all work is carried out to the highest standard. Your luxury bathroom comes with a 2-year workmanship guarantee, as well as a 5-year product guarantee, and there will be no hidden costs when the bill arrives. Our team will treat you and your Chilworth home with respect during the renovation, and will take care to ensure that the luxury bathroom project causes minimal interruption to your daily life. We have over 12 years’ experience in high specification bathroom fitting, so you can rest assured that your property will be in safe hands when you choose Stile-It. View our gallery for an idea of how a Stile-It luxury design can transform your Chilworth bathroom. If you want Stile-It to provide you with a luxury bathroom design for your home in Chilworth, get in touch on 02380 633966, or send an email to info@stile-it.co.uk.